Building a well-connected network takes time and effort, but if you have fun along the way, it could make your life a lot easier. Hey everyone, pull up a chair. In fact, fill out a nametag, introduce yourself to the person sitting next to you, and tell us what you do. This episode is about one of the single most important skills you can learn in life: Networking. As always, I was out on a run to figure out this week’s topic. 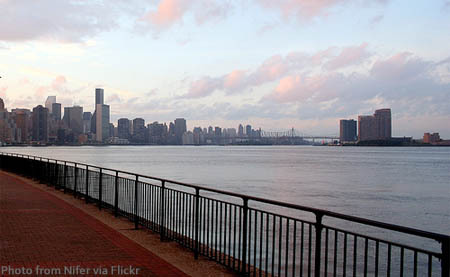 I’m usually a morning runner, but this week found me gliding down the edge of Manhattan’s East River at dusk on a summer Sunday. They’ve done a great job landscaping and carving out areas and installing benches and tables for people to relax and take in the view, and I saw two older women sitting and chatting at one of the tables. Two things struck me. First, they had brought their own bottle of Merlot and were drinking from wine glasses, and second, they had brought their own tablecloth to put over the standard issue, bolted-into-the-sidewalk table. I took in the scene as I went by, knew I had my topic for the week, and stopped to chat on my way back. My first thought was, ladies and gentlemen, this is New York City. Seriously. Yeah, we don’t have houses with manicured lawns and Weber barbecue grills on the deck and home offices in the basement. In fact, a large majority of us lack things like bedrooms. And closets. And dishwashers. But geesh, we do have moxie. Upon speaking to them, they told me that they talked on the phone this morning, said lets get together for a drink tonight to watch the sunset, and we’re making the entire city itself our balcony. That’s making it happen. They even brought the little metal clips to keep the tablecloth attached! Brilliant! Maybe you’re thinking, hey, I network every single day on Facebook and Twitter. And, you’d be wrong. Yes, you might be social networking, but just because you haveÂ a few hundred friends on Facebook doesn’t mean you’re truly connected to them. Granted, I’m not breaking any new ground here. But sometimes we all need a little reminder. You know when you run into someone quickly, and you both say “hey we should get together some time?”Â You know what, I now make a significant effort to do that. Don’t just let it slip. Make a real connection. I challenge you to use these amazing new tools to truly connect with people on a different level. So pull out your Blackberry right that second to send yourself an email reminder to connect with them. 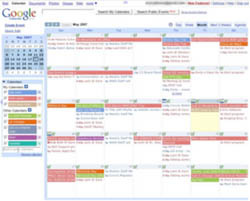 Pull up your Google calendar to find an open date. Skip over to Yelp to find a coffee shop you’ve never tried. And put that shiny iPhone to good use and call them to get together. You won’t regret it. Here are some of the networking tips that I’ve developed. 1) Keep track. Yes, I’m data geek, and I started a Google Docs spreadsheet to keep track of networking connections. Not my best friends of course. But the ones that start out as loose ties. In other words, that person you met at a conference, the new business connection, or a friend of a friend. Before you toss that business card, take 1 minute to simply jot down their name, title, email, and where you met them. 2) Attend events. Start with hobbies you love doing, and pick industry events that you actually like going to. Maybe it’s a dynamic speaker or a class or a meetup group. Force yourself to skip this week’s episode of American Idol, and aim to go to at least 2 every month. 3) Don’t expect the world. I go into every networking event with 2 simple goals. If I can learn one thing that I can use in my job or in my life, or if I can meet just one person that I have something in common with, then it has been a success. 4) Have fun. I’ll admit that we can be very spoiled here in NY. There is no shortage of after work cocktails or lazy weekend brunches, and we’re all just a short subway ride or cab ride away. Why have a rushed 4pm office meeting in midtown when you can have a connection over coffee in SoHo on the weekend. But do what works for you… it could be baseball in Boston or church in Chattanooga or snowboarding at Snowbird. – Wired’s PR person Jenna is a good friend and connection superstar. At an event she hosted, I met Jia and Federico, the co-founders of Roomorama.com. This led to podcast episode 26, profiling their business. – At the Wired Store event, Jenna connected me with Rana Sobhany of Medialets.com. This also led to a podcast interview about iPhone analytics. – I hadn’t spoken with Rana in many months, until I saw her again at Jenna’s birthday party. We have plans for lunch this Thursday. – Also randomly at the party was Anthony Casalena, who I had previously met when I interviewed his company Squarespace.com for The Hopkinson Report podcast while at SXSW back in March. – And also at that same event, I met someone visiting New York for the summer. She is a social media instructor, and said she could give me tips for a course I am teaching this fall. 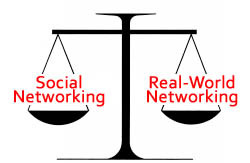 Rather than simply connect via email, I invited her to an internet marketing meetup group I attend once a month. While we were there, we hung out with my friend John, an SEO consultant that I met there at one of the original meetings a year ago, and have been friends ever since and collaborated on a few projects. 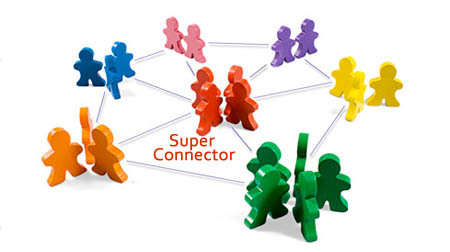 – One thing to keep an eye out for as you network is super connectors. It was only by sketching out this podcast that I realized just how many connections I’ve made through Jenna. These people seem to give you an exponential amount of key contacts just by being around them, so you should make an extra effort to stay in touch with them and find yourself at events they attend. – Another one of those people is Saul Colt from Zoocasa.com. 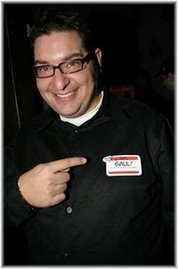 I met Saul at an event that I thought looked pretty cool, a panel discussion on social media that included Saul, Wired’s Jeff Howe of Crowdsourcing fame, and Tony Hsieh of Zappos.Â Saul became a guest on the podcast and was fantastic. Then he told me about Sarah Prevette, who also a great podcast guest talking about her company Redwire. Then he told me about author Mitch Joel, which led back to a speech that Mitch was giving in New York, which led to a dinner that was actually attended by Wired freelance writer Frank Rose, who of course I originally met through Jenna.Â Coincidentally, both Saul and Jenna have almost the exact same number of friends on Facebook, around 675. – Back to my Roomorama friends for a second… We had been out of touch, so we met for brunch to catch up on Sunday. But rather than just the three of us, I brought along 2 friends of mine (Bobby from the JetBlue and Brunch episode). By the time all the coffee and bacon had been consumed, Bobby was ready to try out Roomorama.com for some upcoming trips this fall. I met Daniel Odio through a connection and he was a great guest on the podcast talking about his company PointAbout.com. He is based on Washington DC. The only person I know there is my former intern. Who by the way, was looking for a job. Long story short, a few email introductions and she starts freelancing for him this week. Frankly, I don’t understand why every “job skills” class isn’t simply a “how to network class.” Every study out there tells you that it’s the most common way to find one. Why do anything else? I met Helen Todd from The KBuzz at the Facebook party at SXSW in Austin. She came on the podcast. Later, she was able to help me with a business problem that very few people could have helped with. Now she’s moving to New York so I’m sure that network will grow. Then there’s a guy from the Netherlands we met playing pool on Saturday. He was pretty cool so my buddy and I brought him to the birthday party we were going to. No story there, just thought it was fun to invite a random stranger from Amsterdam to a party. See, not every one of your connections has to work out. Social media on the web has made it easier than ever to set up a connection of people to help you find a job, solve a problem, or enjoy their company outside the wired world. It’s up to you to make it happen. This entry was posted on Wednesday, August 5th, 2009 at 11:01 pm and is filed under Facebook, Job Search / Interviewing, New York City, Social Networking / New Media. You can follow any responses to this entry through the RSS 2.0 feed. Both comments and pings are currently closed.